This product is not yet ranked. It will be ranked when it has 10 or more reviews. Rated by 3 readers at 100% who deem this a HIT. A recommended purchase. However, more ratings are needed to be sure. Adventure: This tabletop role-playing game adventure also is a self-contained mini-setting. 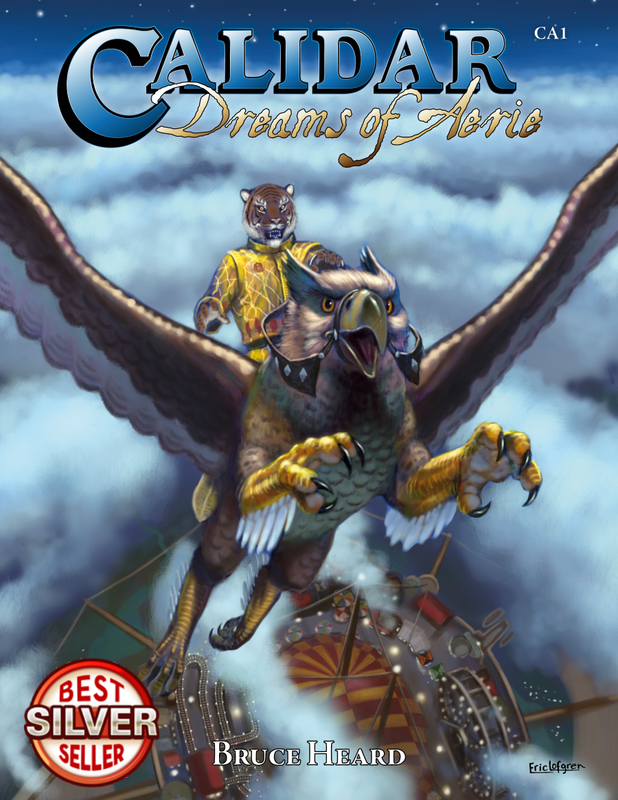 Because the action takes place on a flying circus, Dreams of Aerie is easy to adapt to any game world. Drawing on Barnum & Bailey and Cirque du Freak, this book's main plot elements involve a murder mystery, the rivalries of circus guilds, urban adventuring, and monster-hunting. Countless hooks allow side trips and alternate storylines, as each of the 90+ circus folk hide shadowy pasts and secret motivations. The heroes must contend with secret societies vying for hegemony among circus folk. If left to its own devices, a monstrous presence hidden aboard heralds catastrophic world events. Sourcebook: This book's setting includes the circus itself, standing amid side shows and carnie shacks, themselves surrounded by a ring of permanent shops and dwellings called aeries, perched at the edge of the clouds. Two more decks lie below with all that the Greatest Show on Calidar needs to function, as well as its stranger secrets. The flying circus can be used as a permanent home base for player characters, with plenty of adventure hooks to fill the cracks between expeditions "away from home." Although written for the World of Calidar, this setting is nearly self-contained until the referee starts unfolding the hidden stories of circus folk, and connects them with the chosen game's universe. Contents: Dreams of Aerie is a 132-pg full color book, 8" 3/4 x 11" 1/4. The digital file is fully indexed. The hardcover book is printed on premium heavyweight paper stock for best result with the many maps included therein; the softcover book uses standard color paper. Deck plans are included in the book, as two-page spreads and as inset maps. Deck plans can otherwise be obtained at a discount when purchased with this book, as separate 12"x18" posters, both labeled and unlabeled. This book is system-neutral: guidelines to help adapt the adventure's game statistics to common RPGs are available as a pay-what-you-want title. I received the hardcover book just before Christmas, and I'm very happy with the quality of it. It has a feeling of parchment, and the art is a mix of full page art, like the front cover, and also black and white line drawings. The content is very detailed in laying out the locations and personalities in this flying circus. I intend to use this as an occasional place to visit in my games, perhaps having the PCs visit once or twice before running the main adventure. As for the main adventure, I'll have to read it in depth to be able to comment, so consider this a flip through review. One feature I think is very good though is the set of progressive events for each faction, so you can work through the suggested encounters depending on how the party proceeds with respect to each group. Also worth noting are the excellent maps, and the included statistics for characters and monsters. While not based on any given RPG system, they are a good guideline for 'statting up' into whatever system I choose to use. Most likely I'd use the D&D Rules Cyclopedia or Whitehack, depending on the group. Not just an adventure, but a sandbox mini-setting full of memorable characters, which can serve as a base to carry the PCs around the world after the adventure has run its course. There's enough here to keep the players busy for quite a while, should they wish to follow up all of the leads sprinkled throughout. The adventure itself is a murder mystery, with a cast of close to a hundred to help — and hinder — the PCs in their investigations. With art from Eric Lofgren, Joe Garcia and Steven Cummings, and Bruce Heard's signature floor plans, the book contains a wealth of material for referees to run the mini-setting. The first aspect of Dreams of Aerie that impresses the reader are the artwork and the great, coloured maps. Then you get the brilliant concept of this setting-adventure: it is a Flying Circus (in the sense that it is a circus set on a huge flying vessel) that constantly moves over the Great Caldera of Calidar (but, considering the situation and the setting, probably it won't be too difficult adapting it to any fantasy or stesm-punk setting of your choice), with plenty of strange and fun and scary performers, of course: a whole society, with its own relations, likes, dislikes, friendships, enemities, intrigues! On this sandbox setting, you will have to do your investigation, and I can guarantee that you will find plenty of surprises, as it is usually the case, when you go to the circus!